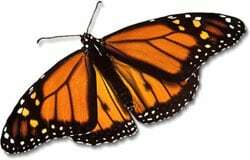 Everyone knows just how beautiful butterflies are, but by just using your eyes, you are mission out on so much detail. So for those of you who have never viewed them through a pair of binoculars, you are in for a real treat! So just what makes a good pair of binoculars for butterflies and what features do we need to look out for? So what is a good minimum? I would say that anything at or under 6ft (1.8m) would be fine and you can take a look at all the Close Focusing Binoculars, that I have so far reviewed - all of which have a close focusing distance of 6ft or under. 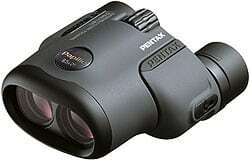 Pentax have produced a series of binoculars that are ideal for viewing things like dragonflies and butterflies. The name "Papilio" actually Latin for Butterfly and they have incredibly close minimum focusing distances. Pentax produces the Papilio in two configurations 6.5x21 and 8.5x21 and both can focus on an object from about 1.6ft (0.5m) away. The Papilio's have been designed as a special purpose close focus instrument but you can use them for something like birdwatching with an acceptable result, but you will not get the detail and brightness from more specific birding binoculars with larger objective lenses. Yet I feel that their fairly low price makes it acceptable to justify buying a pair as a special purpose butterfly binocular, even for those who are only starting to get interested in bugs and I highly recommend a pair to anyone interested in getting a much better view of butterflies, dragonflies, or flowers. 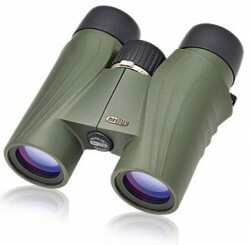 With a minimum close focus of 3 feet (0.9m), the 6x32 Eagle Optics Ranger SRT, is nice compact binocular ideal for viewing objects like butterflies from close range. The Ranger has a lightweight, durable body, and comes with an affordable price tag, making it easier to justify getting yourself a dedicated close focusing binocular. Fully Multi-coated Lenses that increase light transmission with multiple anti-reflective coatings on all air-to-glass surfaces. Phase Correction	Coatings that enhances resolution and contrast through roof prisms. Other highlights include soft rubber, multi-position eyecups and very long eye relief (19.5 mm). They also have a very wide (409 ft.) field of view and the Eagle Optics Platinum Protection unlimited, unconditional lifetime warranty. Like the Eagle Optics Ranger above, these 6x32 mid sized binoculars have an excellent minimum close focus of only 3 feet (0.9m). 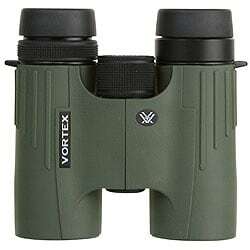 According to Vortex, Viper, customers have been amazed by the bright views and sharp details delivered through superior optical engineering, which I cannot confirm, but will say that their as well as their close focusing distance, their field of view of 420 feet at 1000 yards is excellent as is their full 19.5 mm of eye relief. Extra-low Dispersion (XD) Glass that enhances resolution, color, and contrast. 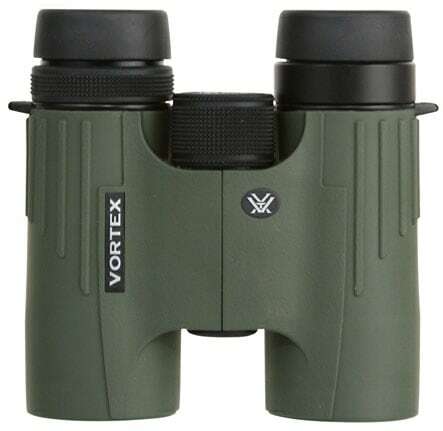 The Meopta equivalent of the Vortex Viper and Eagle Optics Ranger above, comes with a slightly higher magnification of 6.5x. This means that you will get a little more image detail, but makes the exit pupil just a little smaller. 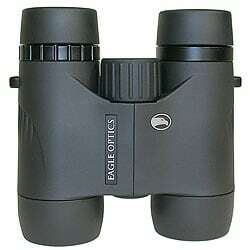 This Meopta binocular has a minimum close focus of 3.28ft (1.1m) which is a fraction more then the two above, but still should be plenty close enough. Other impressive features include their wide FOV of 432ft @ 1000 yards and a very long eye-relief of 22.3mm. Close Focus Meopta MeoPro 6.5x32 Binoculars - I this article, I take a closer look at these excellent looking compact, close focus, wide angle binoculars. This is not as important when observing the details close up of a slow moving object, but if you also would like to use your binoculars for things like birding or for taking to a sporting event, then the field of view (FOV) becomes much more important. The FOV is basically the width of the scene that is in view when you look through your binoculars, for a full explanation see field of view in my optics glossary. This is very important if you use glasses. Take a look at Eye Relief in my glossary for a detailed explanation, but basically it is the distance behind the ocular lenses where the image is in focus. If you wear glasses, you can't get your eyes as close to the lenses than people who don't and so you need a longer eye relief that basically projects the image beyond the ocular lens. If you wear glasses, you should be looking for an eye relief of at least 15mm, to see the full image full image projected.